For many, the decision to attend The Catholic University of America grows from a desire to walk the path of their faith. Your next four years will be spent alongside friends, mentors, teachers, spiritual guides, and allies who — like you — seek daily strength and virtue by living and learning within the light of Catholic faith. Within our faith community, that light shines across every aspect of our intellectual pursuit, student experience, global exploration, community service, and prayer-centered awareness. At the center of the University's faith life is the Office of Campus Ministry. 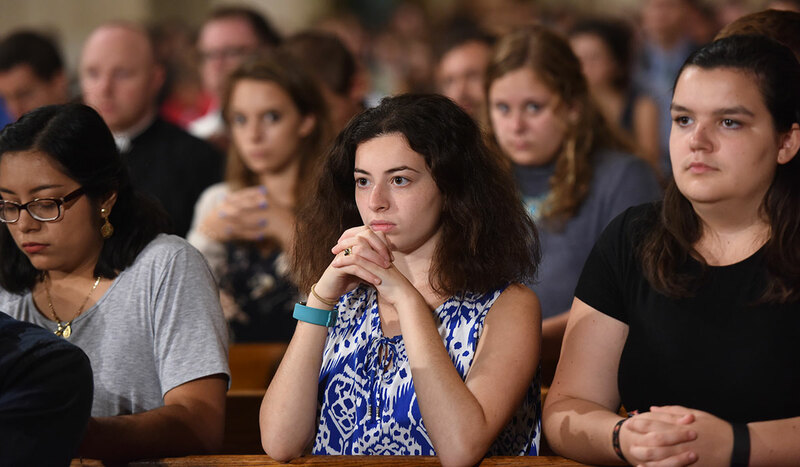 At The Catholic University of America, you are encouraged to take your faith as deep and as wide as you desire. Through fellowship you will form friendships that last, built upon a strong foundation of faith, and have every opportunity to lean further into your relationship with God. Make the most out of the beautiful, sacred spaces, right here on campus and across the greater Washington D.C. area., where communities of any faith can gather to pray and worship. Our ministry-focused student groups such as Esto Vir (brotherhood), Gratia Plena (sisterhood), Catholic Athletes for Christ, and many more enliven student experience and carry out their important work on behalf of the Gospel.